Inheriting the many merits of top-of-the-line Yamaha handmade flutes, this model offers rich, nuanced tonality over a wide dynamic range. The 500 series combines the brilliance of nickel silver with the characteristic mellow timbres of sterling silver. The 500 series flutes come with hand-finished headjoints based on the Type A headjoints supplied with the 800 and 900 series handmade flutes. The keys feature traditional pointed key arms, reflecting the highest level of craftsmanship and adding visual elegance to these outstanding instruments.. The headjoint, body and footjoint are heat treated through an annealing process that allows the instrument to vibrate more freely, providing optimal response and beautiful resonance. 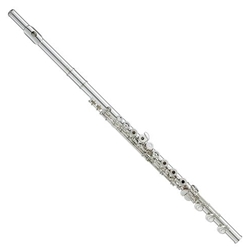 The keys are hand-assembled and meticulously balanced for a perfect touch, and the key shapes have been so exquisitely designed and ergonomically placed that the flute will almost ‘disappear’ in your hands. Performances will feel effortless and natural.